Nearly two dozen people, some of them students on their way to school, were injured this after an SUV ran a stop sign, crashed into a city bus, which then sent that bus filled with passengers careening into a northwest Miami-Dade building Thursday morning. Meanwhile, a white car riddled with bullets also stopped at the crash scene to request help. Chopper 6 captured aerial images after the bus slammed into the Everything Warehouse store just before 7 a.m. at 1551 Northwest 36th Street in Miami-Dade. The store sells house fixtures and appliances. 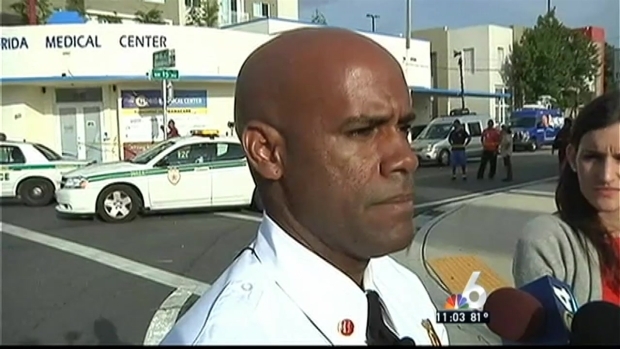 Team coverage on major accident involving a county bus that slammed into a building in Miami. Steve Litz is at the hospital, while Bobby Brooks and Julia Bagg are on the scene. "I was going to work and I was on the front of the bus, my bicycle was totally lost, and we were sitting there, I laid my head on my helmet to catch a few Z's and next thing I know, my head hit the rail and then I flipped over, my arm got caught, people was on top of me," passenger Tempie Lowe said. Traffic to the area of Northwest 36th Street and 17th Avenue was shut down as multiple crews respond to this very active scene. NBC 6 South Florida has learned that at least one person, a driver of that SUV, was arrested at the scene of that crash. However, police say that person is under arrest for an unrelated incident. The SUV driver was later identified as 34-year-old Natashus Registe. The details of this unrelated incident are not yet known. Nearly two dozen people were transported for treatment for injuries, and one person was treated on the scene of the crash, according to police. Their injuries are described as relatively minor. The driver of the bus is said to have sustained the most serious injuries, but is expected to be okay, police say. 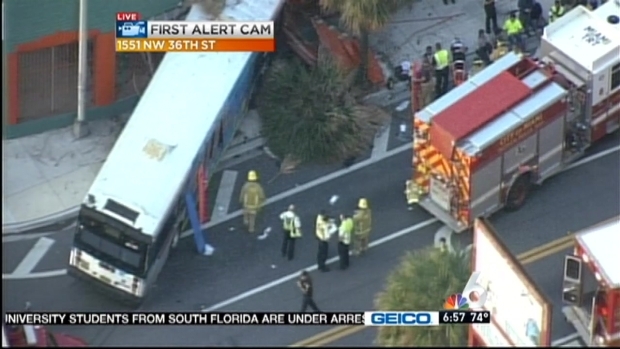 An SUV hits a bus, and the bus slams into a building in NW Miami-Dade. Kelly Blanco has more. Officials at Jackson Memorial Hospital said 15 patients were taken there with two in serious condition and 13 listed in good condition. "With the amount of people that we had on this bus, this incident was a mass casualty level 3, with over 20 patients," Miami-Dade Fire Rescue spokesman Ignatius Carroll said.